Few things infuriate me as easily as having picked the wrong subtitles for a movie – and finding the right ones could often be a malware-ridden hassle. But this gorgeous app turns this frustrating process into a child’s play. 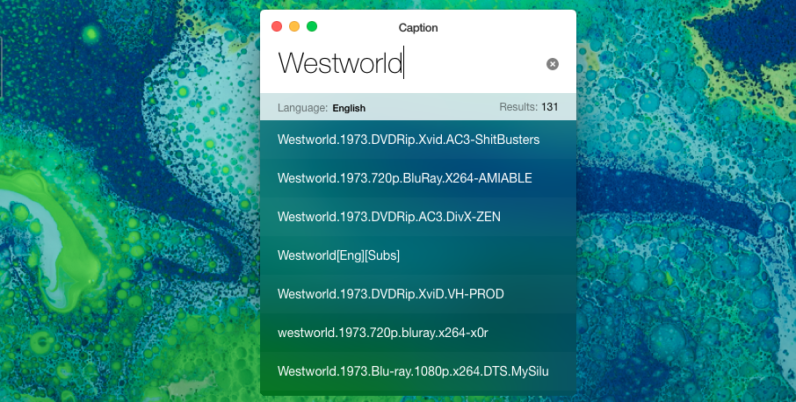 Built by Dutch developer Giel Cobben, Caption is a nifty app for desktop that lets you find and download the right subtitles for any movie or television show you want to see. What is particularly handy about Caption is that it will also automatically rename the subtitles so they match the title of the movie. The app also comes with a neat ‘drag and drop’ feature that allows you to effortlessly find and download subtitles by dropping the file inside Caption. All you need to do once Caption has identified the right subtitles is double-click on the file to play the video – with the captions already integrated. The best thing about the app is that it also supports a wide variety of languages, so you can easily find captions in your local language. While Caption is currently only available for macOS, Cobben says he’s working on a cross-platform solution and promises the app will land on other operating systems too. For those curious to have a look at the code of the app, you can head to this GitHub repository. And in case you want to make some changes of your own, you can do that too – Caption is entirely open-source.